This January, Brazil inaugurated Jair Bolsonaro as president, a fascist who has made his intention to align the country close to Washington’s interests no secret. During Bolsonaro’s recent visit to Washington, he became the first president of that country to visit CIA headquarters in Langley, Virginia. President Donald Trump said during his meeting with Bolsonaro that “We have a great alliance with Brazil—better than we’ve ever had before” and spoke in favor of Brazil joining NATO. Though Bolsonaro’s government has claimed late in February that it would not allow the U.S. to launch a military intervention from its territory, Bolsonaro’s son, Eduardo Bolsonaro—an adviser to his father and a Brazilian congressman—said last week that “use of force will be necessary” in Venezuela “at some point” and, echoing the Trump administration, added that “all options are on the table.” If Bolsonaro’s government does allow the “use of force,” but not a full-blown foreign military intervention per se, its closeness to the Trump administration and the CIA suggests that covert actions, such as those carried out by the proposed RED Teams, are a distinct possibility. FDG also states on is website that it also regularly does work for the Council on Foreign Relations and the Omidyar Group—which is controlled by Pierre Omidyar, a billionaire with deep ties to the U.S. national security establishment that were the subject of a recent MintPress series. According to journalist Tim Shorrock, who mentions the document in a recent investigation focusing on Pierre Omidyar for Washington Babylon, FDG was the “sole contractor” hired by USAID to create a “new counterinsurgency doctrine for the Trump administration” and the fruit of that effort is the “RED Team” document described above. In addition, according to Shorrock, Courtney’s name has also been found “on several Caerus [Associates] contracts with USAID and U.S. intelligence that were leaked to me on a thumb drive, including a $77 million USAID project to track ‘licit and illicit networks’ in Honduras.” Courtney, according to her LinkedIn account, was also recently honored by Chevron Corporation for her “demonstrated leadership and impact on development results.” MintPress recently reported on the role of Chevron in the current U.S.-led effort to topple Maduro and replace him with Guaidó. Given that the document represents the efforts of the sole contractor tasked with developing the current administration’s new counterterrorism strategy, there is plenty of reason to believe that its contents—published for over a year—have been or are set to be put to use in Venezuela, potentially as part of the upcoming “Operation Freedom,” set to begin on April 6. Furthermore, it would make sense for the Trump administration to attempt to enact such an initiative as that described in the document, given its apparent inability to launch a military intervention in Venezuela, despite its frequent claims that “all options are on the table.” Indeed, U.S. allies—including those close to Venezuela, like Colombia—have rejected military intervention, given the U.S.’ past role in bloody coups and civil wars throughout the region. 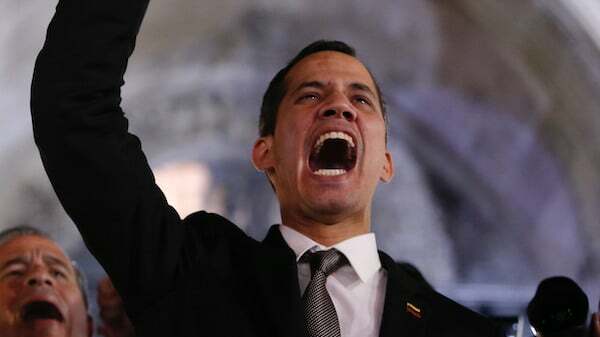 Thus, with its hands tied when it comes to military intervention, only covert actions—such as those described in the RED Team document—are likely to be enacted by the U.S. government, at least at this stage of its ongoing “regime change” effort in Venezuela.